During your initial consultation, Dr. Middleton will address your personal concerns regarding your oral health and your previous dental experience. With your permission, he will perform a detailed comprehensive oral evaluation, discuss his findings with you, and present customized options that will fit your surgical needs. For our straightforward cases, we will provide you with a written plan that includes both the treatment length and financial estimate. Patients who have complex surgical plans, we encourage you to bring a family member to your initial visit. Often times it is helpful to have an extra set of ears to assist in understanding the surgical options that will be discussed. Referral and any X-rays or photos given to you by your referring doctor. List of all current medications and any known allergies. Drivers license or ID card. Please note that patients under the age of 18 must be accompanied by a parent or legal guardian at all times. Dental and/or medical benefit card (s). Although referring doctor may have provided x-rays or photos, Dr. Middleton may require taking new images for proper diagnosis. 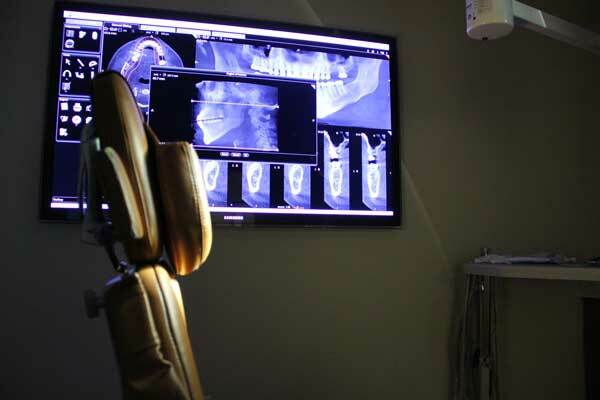 Our practice utilizes a state-of- the-art cone-beam CT unit that provides high accuracy with minimal radiation exposure. This technology enables Dr. Middleton with the highest level of accuracy to provide the proper diagnosis and to ensure your customized surgical plan is to your benefit. Occasionally same day surgical work may be an option, this will be determined once Dr. Middleton reviews your medical history and provides you with a surgical plan. Patients with complex treatment plans, compromised health, and those requiring intravenous sedation will be scheduled for a separate visit to ensure pre-operative measures are followed in preparation for their procedures.